Property map for Sweden included. Click on Map, Edit and Enable property boundaries on your team's homepage. Property boundaries will show on all your hunting grounds and an area about 500 m beyond. There is no need any longer to buy Land Registry property maps. All team members and their guests will be able to access the property map at no extra cost. 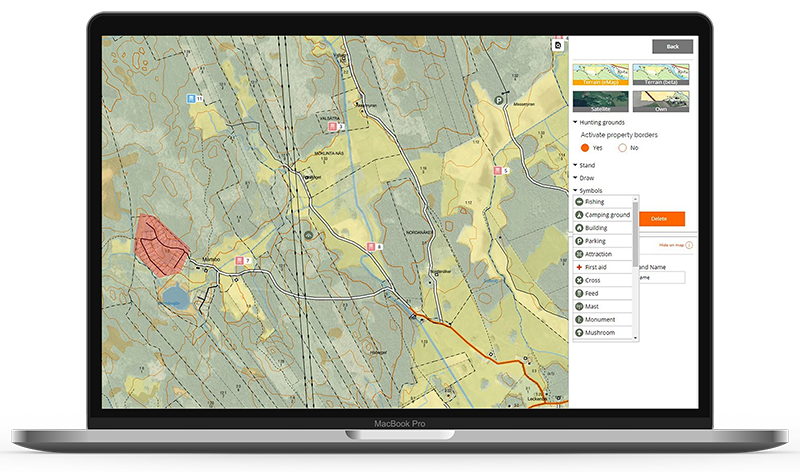 When property boundaries change at Lantmäteriet (the Swedish Land Survey) they will change on your Easyhunt map as well. We hope to be able to show property boundaries in Finland, Norway and Denmark starting in 2019. The New Easyhunt eMap map is probably the world's most advanced hunting map. Most other maps are based on raster maps composed of a myriad of little squares, or pixels, for different magnification levels. When you zoom in or move sideways each pixel has to be downloaded. As a pixel is quite heavy (lots of kilobytes) it takes time to download them to a smartphone and in poor mobile coverage the pixels may download slowly one at a time. eMap is as far as we are aware, the hunting world's only vector map. Vector maps contain digital data only that download lightning fast to a smartphone, which in addition saves all downloaded map data. This means that you can access your map immediately, no matter where you are. The new improved map editing tool makes it much easier to edit the map online. And in addition, with the property map as a base it is much easier to mark the boundaries of the hunting ground. The Easyhunt map facility is free to try for three months. After the trial period the cost is only €38 per year for a hunting team of up to 15 members. Find the full price list here. The cost stays the same irrespective of the number of guests - individual members and guests don't pay extra. 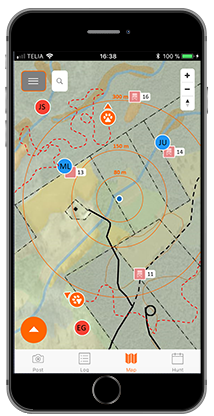 Each hunting team member and guest is able to use the app to view, for example, property boundaries, stands, every hunter's location and all dogs equipped with an eTrack dog tracker. No limitations. It couldn't be simpler! In late 2018 we will launch an all new and rebuilt version of the Easyhunt app. It will be easier to navigate the menus and the design will be cleaner and more user friendly. The image at the top is showing a sample from the new app.